As we look forward to Earth Day on April 22, 2018 it’s helpful to reflect on how our industries contribute to the problems – and solutions – that our planet faces. While it has only been around for about 60 years, plastic has both become a technology absolutely inseparable from how we live our lives today, and a massive problem for our environment. In July 2017, industrial ecologist Dr. Roland Geyer and his colleagues published a paper in the Science Advances journal calculating the total volume of all plastic ever produced at 8.3 billion tons and from that, 6.3 billion tons of plastic waste have been produced. Half of this material was manufactured in just the past 13 years, and in only 30 years, we’ll have doubled the amount of global plastic waste. One of the things that makes plastic waste different from other kinds of waste is that it is very difficult to do anything else with it. When glass, paper, and metal cans are recycled, they become the same or similar products, which can then be used and recycled over and over again. With plastics recycling, there is usually only a single re-use. Most bottles and boxes don’t become beverage and food containers again. It’s more likely for a soda bottle to become carpet, or insulation, or stuffing for sleeping bags. Milk jugs are most often turned into plastic lumber, recycling bins, and toys. And then they are thrown into the landfill. Or the ocean. 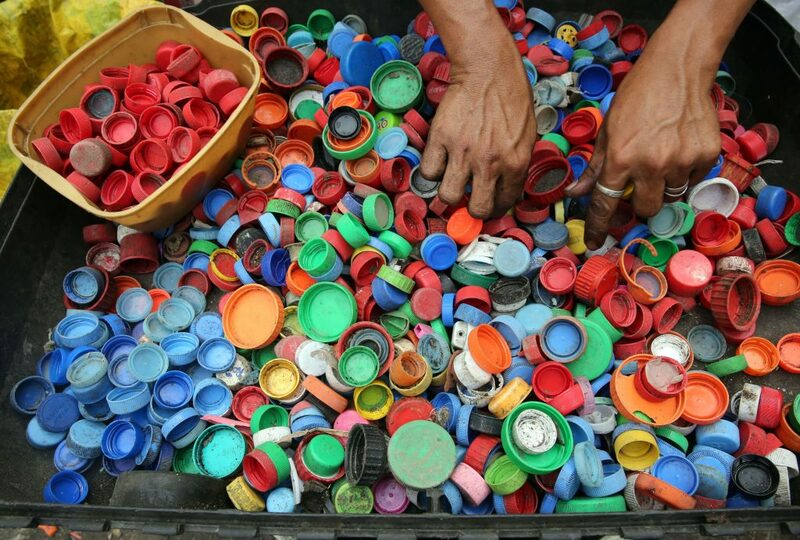 Out of all of our historical plastic, only about 9% has ever been recycled. Right now, only about four percent of all plastic is recycled, compared to 34% of paper, 22% of glass, and 30% of metals. And yet there are opportunities for imaging to show us new solutions. We’ve seen how imaging systems are improving how we recycle and even how imaging technologies like LIDAR are helping to clean up the plastic in oceans. One of the problems is that the term “plastic” is not very descriptive. The term actually describes a wide variety of resins or polymers with different characteristics and uses. “Polymers” are simply long chains of molecules, and while it seems synonymous with plastic many other types of molecules, both biological and inorganic, are also polymeric. All plastics are polymers, not all polymers are plastic. Thermoset polymers undergo a chemical change when they are heated, creating a three-dimensional network of bonds or cross-links. After they are heated and formed, these molecules cannot be re-heated and re-formed – they are more likely to char but retain their strength and shape. This makes thermoset plastics ideal for heat-resistant products like insulation and car parts. Examples of thermosetting plastics include phenolic resins, amino resins, polyester resins, silicon resins, epoxy resins, and polyurethanes. Thermoplastic polymers can be heated and formed, then heated and formed again and again. The shapes of the polymer molecules are generally linear or slightly branched. Examples of thermoplastics include polyvinyl chloride (PVC), polystyrene, and nylons. Their molecules can flow under pressure when heated above their melting point. Because of this, thermoplastics are ideally 100% recyclable – they can be repeatedly melted and remolded into new products. But just because thermoplastics can all be recycled, doesn’t mean that the process is the same. For example, polyvinyl chloride (PVC) bottles are hard to tell apart from Polyethylene Terephthalate (PET) bottles. Both plastics are common, but PET make up 97% of all plastic bottles. And one stray PVC bottle in a recycling melt of 10,000 PET bottles can ruin the entire batch. Proper sorting is absolutely vital to the success of the entire enterprise. Equipment to sort plastics is being developed, but with such high stakes and low margins for error, recyclers are often still sorting plastics by hand. That’s expensive and complicated, leading to recycling workers suffering high rates of turnover and unsafe working conditions that have brought national attention. 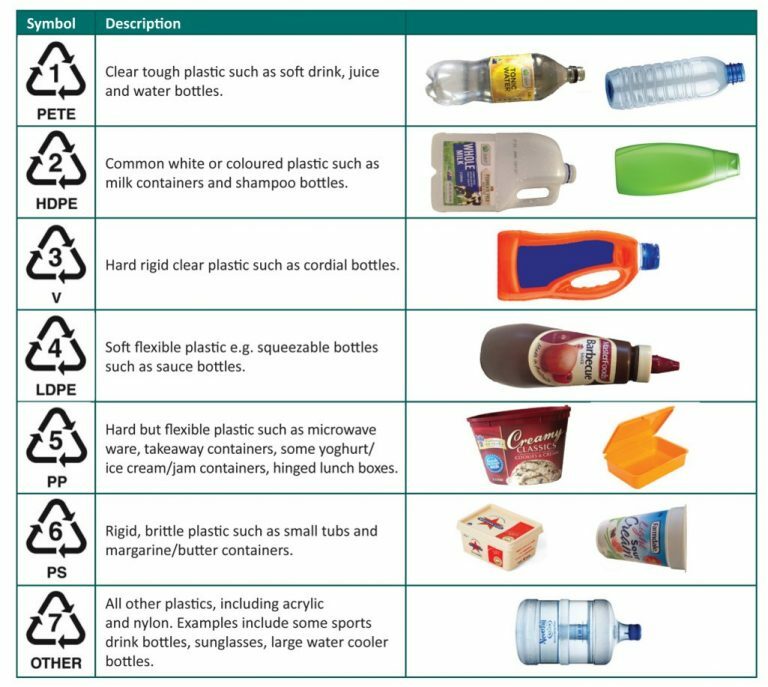 Plastic consumer goods that fall into the 7th category are not usually collected. Plastic tarps, pipes, toys, computer keyboards, all use plastics that do not fit into the numbering system that identifies plastics used in consumer containers. Within this group, there are actually thousands of different varieties of plastic resins or mixtures of resins, developed for very specific application needs. Until recently, no one has entered the business of collecting these plastics because there was no systematic way to identify them. Recycling plants can reduce costs and improve production quality with efficient machine-based identification and sorting methods. Spectral information can be used for real-time material identification, including differentiating between different types of plastic, in different conditions, and identifying recyclable plastics, glass, and metals. Visible spectrum sorting essentially does what the human eye can do, separating colored polymers or labels. Area and line scan cameras can be used to sort recyclable materials by color and shape, separate different color plastics, and to distinguish between recyclable and ceramic glass. The visible spectrum cannot be used to separate plastic by resin type unless the material is visually changed (e.g. by adding a colorant). 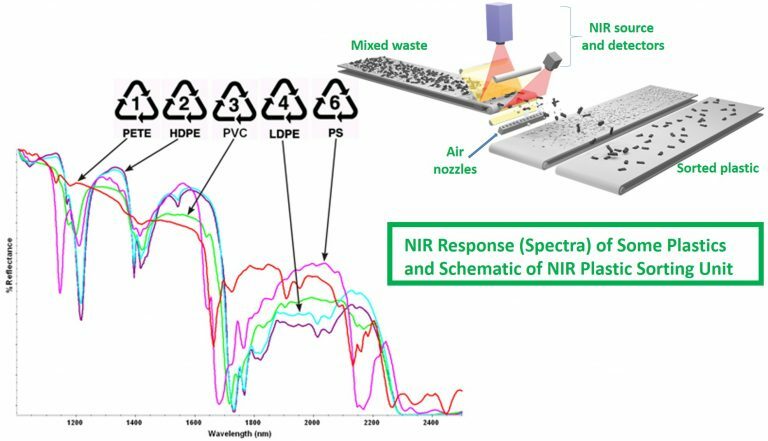 Both SWIR and NIR sensors can go deeper, identifying different recyclable plastics. The sensing system is typically an imaging system that can pinpoint plastics on a conveyor belt. IR radiation from a source along the conveyor penetrates plastic objects as they move by and a sensor measures their unique “fingerprint” response. NIR imaging could even be used to separate all plastics #1-7 but currently may be considered cost-prohibitive for rarer materials. In a real recycling work stream, other imaging materials are needed to prevent contamination: While NIR is used extensively to separate HDPE and PET containers, it can’t “see” glass or metal because those materials’ molecular structure doesn’t “vibrate” enough to be recognized. Imaging plastics at this elemental level can detect heavy elements, toxic substances, and specific atoms among plastics that otherwise look the same as those that are safe to recycle. X-ray imaging is also effective for distinguishing PVC containers — PVC contains chlorine, which gives a unique X-ray fluorescence response. Because it works at such a precise level, it has been useful for sorting extremely dirty bottles or containers with a lot of labelling – situations where infrared would be “confused.” Still, x-ray can be an expensive and complicated imaging modality to employ. X-ray systems involve high energy and require effective shielding to protect workers, making NIR much more popular. This kind of imaging can be helpful for separating plastics from non-plastics. The subtle differences between the hydrocarbons in office paper, newspaper, and cardboard are only detectable beyond standard SWIR imaging. Hyperspectral imaging systems can be used for other difficult-to-sort recyclable materials, such as crushed electronic scrap. While these imaging modalities can make fine differentiations between types of plastic, there is still a lot of manual sorting and automatic resorting going on to minimize expensive errors. This has motivated several companies to look at bringing machine learning and artificial intelligence to this complicated sorting task. The downside is that the contents of every single recycling bin in the world is a jumbled mess. The upside is that there is A LOT of it. What data scientist or AI developer wouldn’t want to work with a sample size of a few trillion? One of the first companies to get into AI-driven waste sorting was ZenRobotics. Their system used a combination of computer vision, machine learning, and artificial intelligence (AI) to run picking and sorting robots. Multiple recycling stations were tied together in a neural network, increasing the sample sizes and how quickly the AI could learn from a combination of metal sensors, 3D laser cameras and spectroscopic cameras. More recently, a pilot collaboration by the Carton Council and two Denver-based companies, AMP Robotics and Alpine Waste & Recycling, produced Clarke, a recycling robot that uses AI to identify food and beverage cartons to separate them from the rest of the recycling workstream. According to Resource Recycling, Clarke uses an off-the-shelf robot that’s been in use for two decades in other industries. Clarke was first installed in 2016, but with constant improvement can now sort approximately 60 cartons per minute with near perfect accuracy. The Clarke AI has learned to recognize images from the cartons including logos and package printing, improving with each round of sorting. There are about 50 different groups of plastics, with hundreds of different varieties. We will continue to generate billions of tons of plastic every year, but to minimize, reduce, and even eliminate the effect of this plastic on planet earth we are going to need several new developments. Today, the bottleneck is sorting. 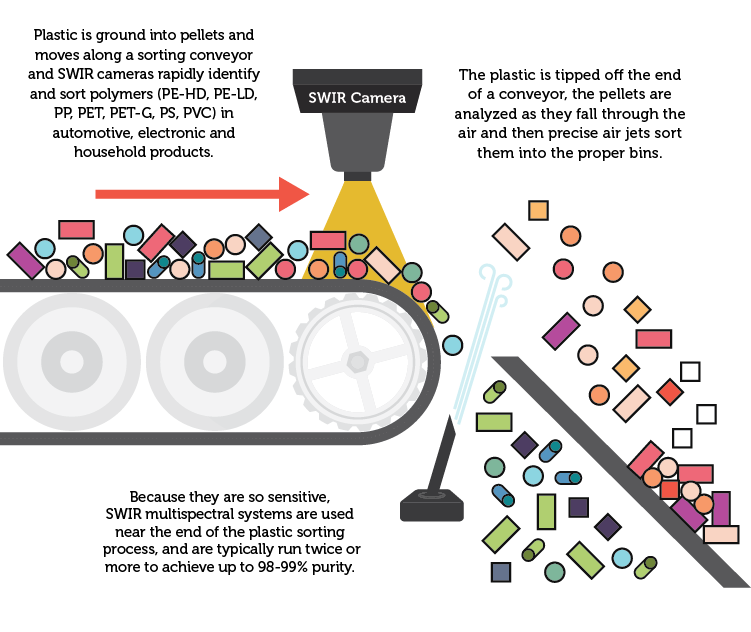 While sorting improves with better imaging modalities and machine learning, governments and industries will need to work toward more recyclable and homogeneous plastics. More efficient recycling will reduce costs and resulting greenhouse gases and toxins. If we keep going the way we’re going, perhaps plastic can become its own sustainable ecosystem.